Garador FGS 750 is part of the highly insulating FrontGuard Plus range. The Garador FGS 750 provides excellent thermal insulation for your home. It has a U-value as low as 0.91 W/m2.K – with an extra thick door leaf filled with thermally efficient PU foam. It also has a thermal break built into the panel design. The 80 mm aluminium frame also has a thermal break. It has a PU foam infill built into its design to further maintain its thermal performance. The door is regularly subjected to the strictest quality tests. This ensures that the product is: water tight under heavy rain, air tight under heavy winds whilst providing acoustic and thermal insulation and security. The FGS 750 modern design doors feature a superb high gloss surface finish. This is as well as 3 other Timber-effect finishes – Golden Oak, Dark Oak and Night Oak. The door is also available in 11 of the RAL colours we provide. This is our unmatched combination of excellent thermal insulation with exclusive looks to enhance energy savings and beautify your home. 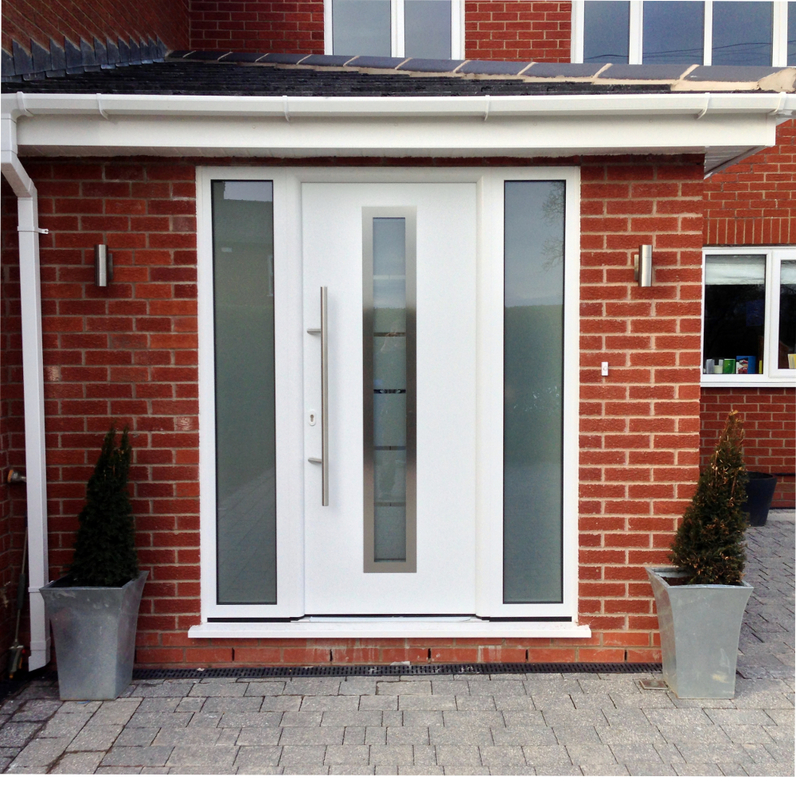 Our glazed FGS 750 entrance door features high quality, insulated laminated safety glass. Whilst triple pane insulated glazing (44 mm) provides even more thermal insulation. A flush fitting appearance on the interior and exterior, as well as a stainless steel glazing frame, accentuates the door’s elegant look. 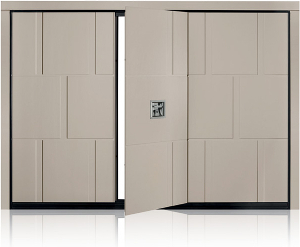 Each FGS 750 entrance door can be supplied with a matching side element and/or transom light. Choose from our glass designs – Sand-blasted Float glass & Clear Float glass – for your individual style. These doors come complete with a 1000 mm long robust bar handle made from high quality stainless steel which blends perfectly with the design elements of the door. We have a Garador FGS 750 Frontguard front door on display at our Lancashire Showroom. Also on display we have a matching sectional garage door. Get in touch or visit our showroom where our staff will be delighted to show these wonderful doors. Steel door leaf with foam filled core and thermal break, exterior and interior overlapping the leaf, 65 mm thick. Standard polyester primer coating White (RAL 9016) in a smooth finish (inside and out). Flush fitting door leaf on the interior and exterior of the door, with a leaf frame on the inside and a thick rebate. The flush fit on the interior gives the impression of a residential internal door can be optimally integrated into your house’s interior. White (RAL 9016) as standard. Ruby Red (RAL 3003), Light Ivory (RAL 1015) and Pigeon Blue (RAL 5014). Foil-coated timber effect in Golden Oak, Dark Oak, Night Oak and foil coated Titan Metallic finish. 4-sided double, black EPDM seals. Brush seal at the bottom, 20 mm high plastic threshold with thermal break. 11-point security: 2 conical swing bolts engage with 2 additional security bolts and 1 deadbolt in the frame‘s lock plates. 3 further security bolts on the hinge side and three barrel hinges. Optional, Traffic white (RAL 9016). Invisible fastening and plastic cover cap at each end. Three 2-piece 3-way adjustable hinges with hinge caps in aluminium look. Contemporary and modern designs all have fixed bar handles on the outside and therefore a key is required to open these doors from the outside at all times. Cylinder length with fixed bar handles: 27.5 x 35.5 mm. Cylinder length with standard lever/lever or lever/knob handle set: 31.5 x 40.5 mm. Cylinder length with Secured by Design lever/lever or lever/knob handle set: 35.5 x 40.5 mm. 5 keys supplied as standard, 8 or 10 keys available as an option. Lead time from point of order to installation is approximately 8 – 10 weeks. Contemporary aluminium door with long window. Up to 94mm thick, highly insulating.